The Rephrasals project and exhibition grew from an invitation from Form/Design Centre in Malmö, and the designers came up with the idea to look back to design classics of their home countries from the last 100 years, seeing them from today’s point of view. The name comes from the term ‘rephrase’, which refers as a verb to expressing an idea in an alternative way. 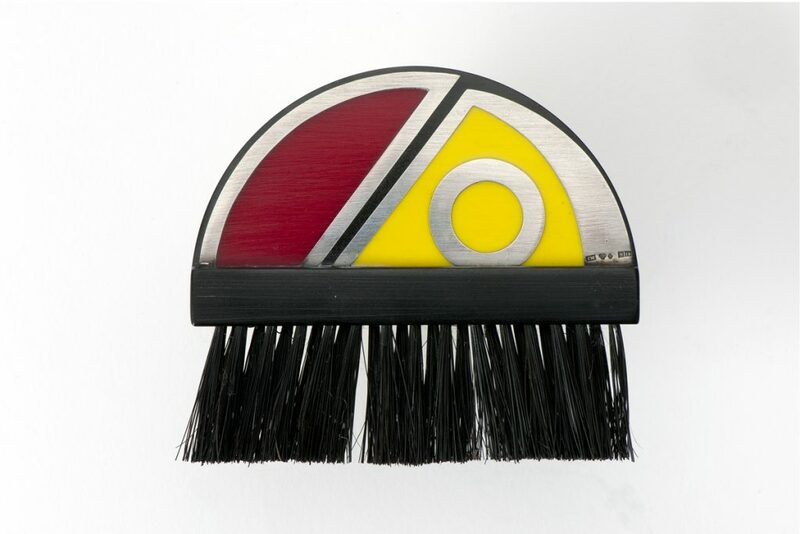 Brush by Wilhelmina Wendt, 1935. The object is an experiment in combining an early plastic material with silver in a broach-like brush. Photo, Per-Åke Persson, courtesy of Nationalmuseum, Stockholm, Sweden. The expressive experimenter, the rephrasal by Aalto+Aalto (original object the brush by Wilhelmina Wendt, described by Petra Lilja), made in cooperation with Ashish Mohite /Aalto ADD Lab. Photo, Bodil Johansson. The method allowed the designers to choose three designs and to describe them literally, not visually, to the other designer. The aim was not to guess the object in question, but rather to design a new object with the same definitions. In the exhibition both the design examples from history and their counterparts are shown together, offering room for new interpretations and points of view. The project and exhibition underlines the value of dialogue, the act of doing something together and the appreciation and role of tradition in designing today. 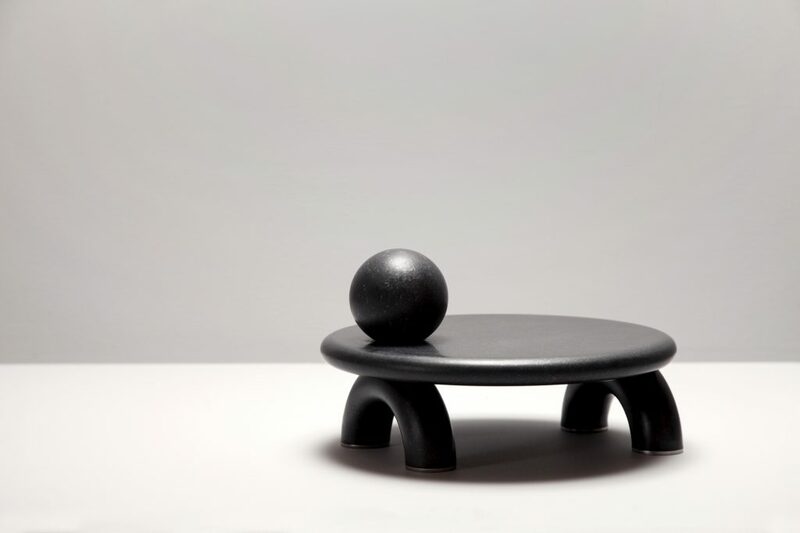 Playful heavyweight, the rephrasal by Petra Lilja (original object the Kilta tableware by Kaj Franck, described by Aalto+Aalto). 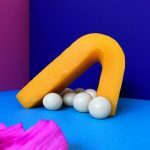 A set of sculptural objects interpreting ”multifunctional” as abstract and simple primary forms, giving the users freedom to play around and apply functions of their own choice. Made out of the locally sourced stone diabas, crafted by Kullaro. Photo, Bodil Johansson. “The method was very inspiring as it forced us to approach designing differently, as some things were clearly defined and some were not. Even the size and the purpose of the object was free from predefinition. Visually none of the objects resemble the original at all, but with a closer look, some resembling themes can be found.” Elina Aalto says. What is the value of ‘playing’ and working together? EA: We also work with commercial design projects, and for us, doing an experimental project which approaches a functional object like an art object is very liberating and feels like playing. 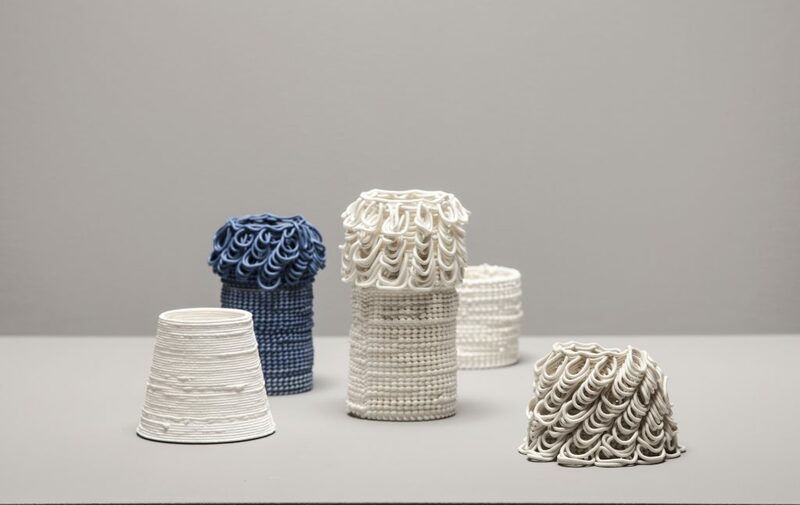 It combines the certain requirements that functional objects have with a freedom of expression which can lead to really interesting and inspirational findings. We seem to work a lot through collaborations; it’s a natural way of working for. And already the fact that we are two people at our end is a kind of collaboration. It’s really rewarding finding likeminded people to work with. We have worked previously with Petra on a project called 1+1+1 which includes a third party from Iceland, a design studio called Hugdetta. And it’s been interesting to see that although English is no-one’s first language and we mainly work through Skype and the world’s longest Messenger chat, we have really similar thinking behind what we do. 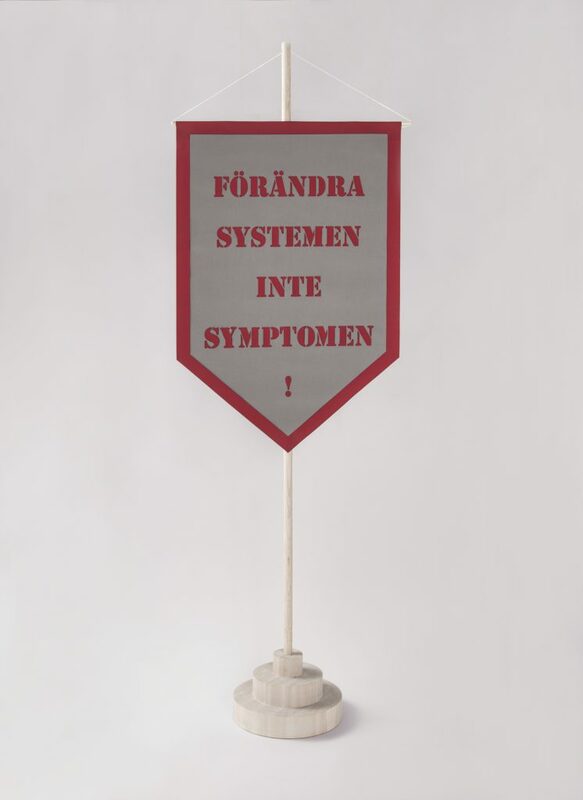 DIY Revolusionist, the rephrase by Petra Lilja (original object Ragamuf by Tuula Pöyhönen, 2016, described by Aalto+Aalto). A banner workshop where the participants can make their own banner with surplus industrial textile collected by the organization Återskapa and produced with laser cutters and embroidery machines in a collective workshop at Malmö Makerspace. Photo, Bodil Johansson. Ragamuf by Tuula Pöyhönen, 2016. 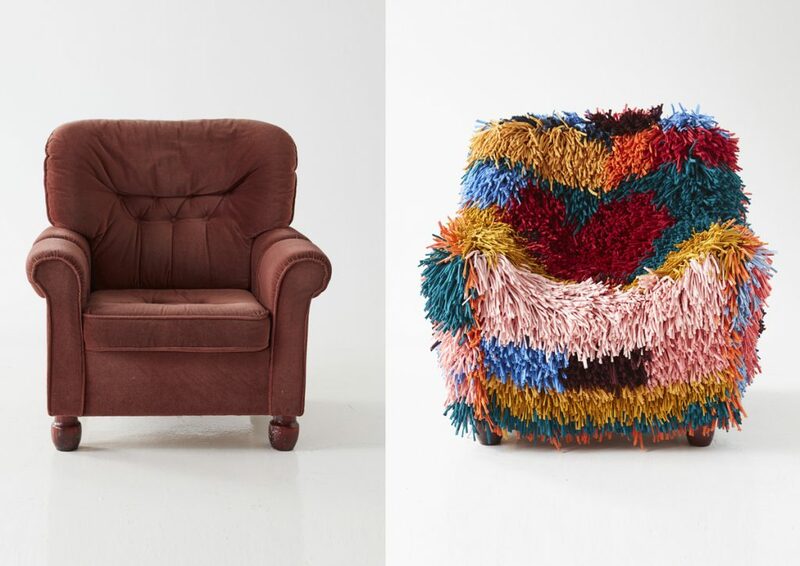 A strechy chair cover made of surplus materials from the textile industry, hand woven by Syrian refugees. Photo, Timo Junttila. What made you choose exactly these design examples? 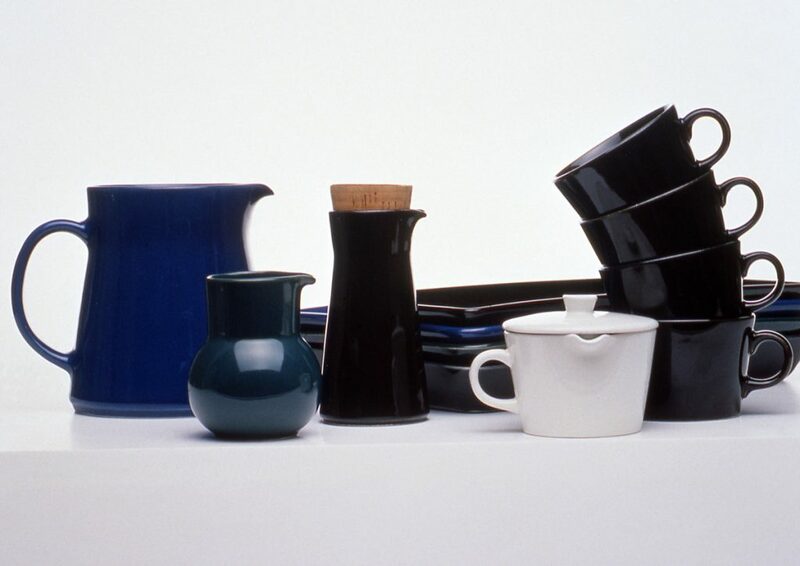 EA: This was actually an interesting task in itself; to curate 100 years of design into just 3 objects. We wanted the pieces to be different in type and size and to be from different eras. They had to exemplify different themes in Finnish design, and there had to be a quality that would make an interesting brief. 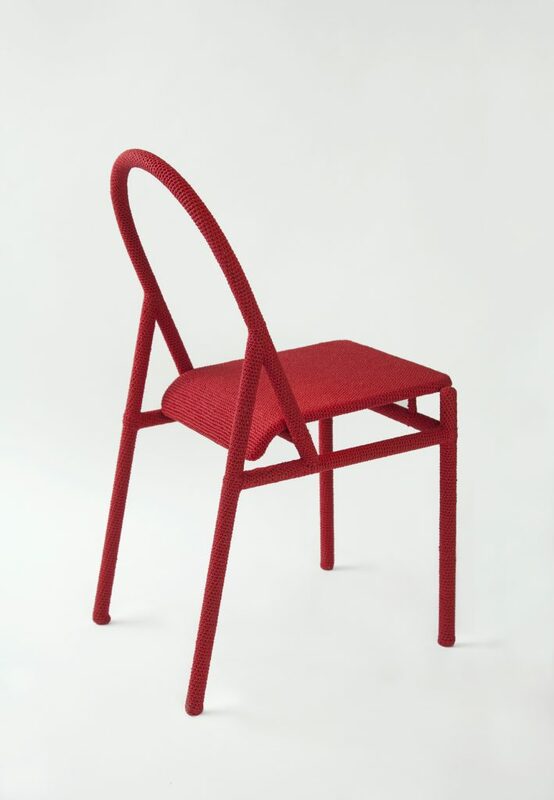 For example, the 004 chair by Antti and Vuokko Nurmesniemi is a very Finnish take on the postmodernism of the 1980s, and we found its play with two dimensionality and three dimensionality to be a really delicious starting point for designing an object. 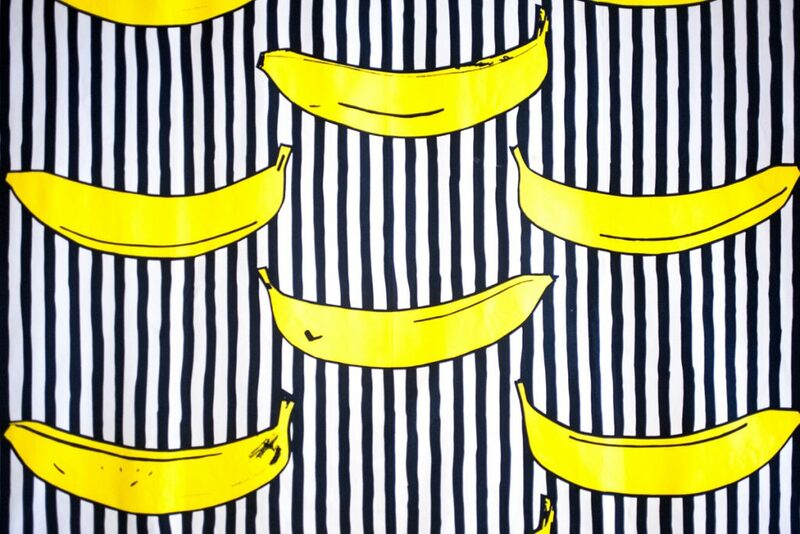 Textile print on cotton fabric Striped banana / Randig banan by Inez Svensson,1986. A postmodern print design made originally for Borås Wäfveri and re-launched by IKEA in 2015. Photo, Petra Lilja. The rephrasal by Aalto+Aalto (original object Textile print on cotton fabric Striped banana / Randig banan by Inez Svensson, described by Petra Lilja). Two steel tube chairs interpreting softness in different ways. One inspired by yarn bombing, upholstered by crocheting and one covered in rubber. Photo, Bodil Johansson. What kind of roles did understanding and misunderstanding have in this project? EA: By misunderstanding we mean a kind of positive misunderstanding – understanding the given description or brief in a different way. None of us actually guessed any of the original objects, so this “misunderstanding” was not at all forced. The descriptions were naturally understood by us in a different way and made into something physically very different.